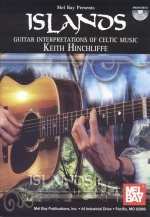 23 striking and varied Celtic melodies for solo guitar in altered tunings, presented in tablature and standard notation. The book includes arrangements of all the tracks on the Islands CD and a copy of the CD itself. The selection spans the Irish, Scots, Welsh and Manx traditions over three centuries and includes slow airs, reels, jigs, hornpipes and strathspeys. Listen to clips of the arrangements below.